All government programs are vulnerable to fraud, waste and abuse – now more than ever. Government fraud is at an all-time high and growing rapidly. Industry research shows that all together, fraud, waste and abuse represent about 10 percent of overall government program spending. But what if governments could minimize deficits by eliminating fraud, waste and abuse? 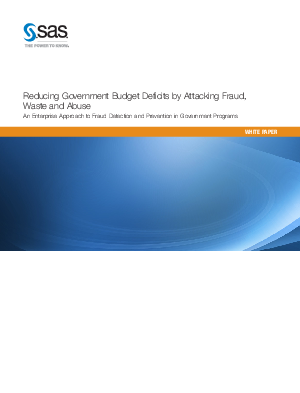 It’s an often overlooked way to close budget deficits – and one that forwardlooking government leaders are already acting on by implementing enterprise-level, state-of-the-art fraud detection programs designed to keep pace with increasingly sophisticated perpetrators.